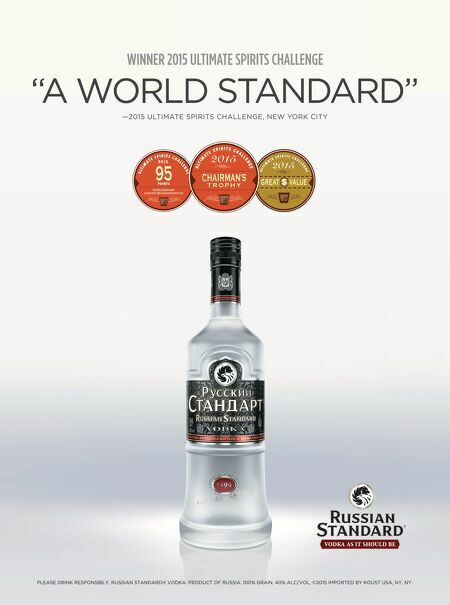 www.cheersonline.com 18 • March 2015 RISING SPIRITS 2015 Growth Brands evolve with changing consumer preferences THE SPIRITS INDUSTRY is certainly in fl ux, as consumers move away from vodka toward whiskies and embrace fl avored spirits in new categories. The cinnamon whiskey, moonshine and premium bourbon trends continue to mature, increasing competition within the category as brands fi ght for staying power. As that battle plays out, distilled spirits are also competing for market share with beer and wine as customers cross categories more frequently. "Last year was a transitional one for beverage alcohol, as changing consumer trends forced the industry to adapt," says Rogers. "Consumers are no longer tied to one category, as they now approach their consumption type by occasion. Beer, wine and spirits are interchangeable to many consumers, based on how they believe one or the other will enhance their drinking occasion." Spirit brands are also benefi ting from consumers trading up to premium and superpremium brands, turning the corner on the downward trend that began during the recent recession. "What stands out to me most in the beverage alcohol industry right now is the renaissance going on with regard to product quality," Rogers says. "Although consumers are often drinking less, they're also drinking better, which bodes well from a revenue perspective." Then there's Rising Star brand BuzzBallz, a line of premixed cocktails packaged in ball-shaped plastic cans. "BuzzBallz isn't playing into the premium FAST TRACK BRANDS DISTILLED SPIRITS (thousands of 9-liter cases) '13/'14 '10/'14 Brand Supplier 2010 2011 2012 2013 2014p % Change % ACGR Fireball Sazerac Co. 125 350 770 1,870 3,895 ++% ++% Burnett's Vodka Heaven Hill Brands 1,520 1,850 2,039 2,350 2,608 11.0% 14.5% Tito's Handmade Vodka Fifth Generation 364 582 850 1,200 2,200 83.3% 56.8% Platinum 7X Sazerac Co. 470 548 655 738 835 13.1% 15.5% Familia Camarena E & J Gallo Winery 75 250 420 571 725 27.0% 76.3% Bulleit Diageo 90 125 260 450 635 41.1% 63.0% Exclusiv Serge Imports 50 106 290 565 627 11.0% 88.2% RumChata Agave Loco Brands 17 64 325 460 540 17.4% ++% Deep Eddy Deep Eddy Distillery 5 15 60 190 455 ++% ++% The Kraken Proximo Spirits 75 150 225 325 424 30.5% 54.2% Buchanan Diageo 200 235 270 307 362 17.9% 16.0% Don Julio Diageo 180 197 225 270 327 21.1% 16.2% Knob Creek Beam Suntory 140 165 193 231 290 25.4% 20.0% Woodford Reserve Brown-Forman Corp. 127 147 181 221 276 24.9% 21.4% Hendrick's William Grant & Sons 101 134 174 209 246 17.4% 24.9% Evan Williams Flavored Reserves Heaven Hill Brands 55 110 142 165 195 18.2% 37.2% Tullamore Dew William Grant & Sons 68 79 95 115 142 23.5% 20.2% Buffalo Trace Sazerac Co. 35 44 66 96 123 28.1% 36.9% Espolon Tequila Campari America 25 53 75 100 112 12.0% 45.5% (p) Preliminary. (++%) Greater than 100%. 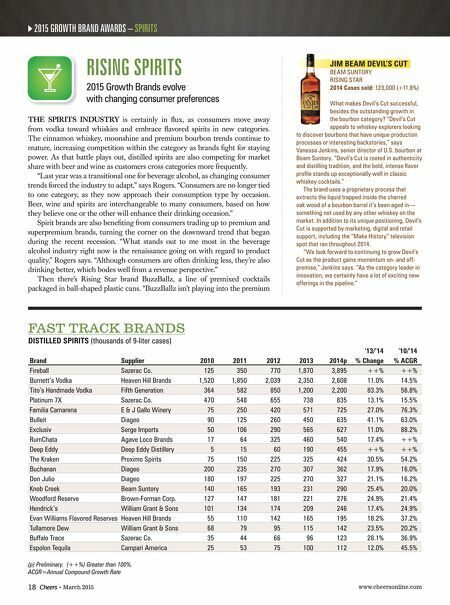 ACGR=Annual Compound Growth Rate 2015 GROWTH BRAND AWARDS – SPIRITS JIM BEAM DEVIL'S CUT BEAM SUNTORY RISING STAR 2014 Cases sold: 123,000 (+11.8%) What makes Devil's Cut successful, besides the outstanding growth in the bourbon category? "Devil's Cut appeals to whiskey explorers looking to discover bourbons that have unique production processes or interesting backstories," says Vanessa Jenkins, senior director of U.S. bourbon at Beam Suntory. "Devil's Cut is rooted in authenticity and distilling tradition, and the bold, intense fl avor profi le stands up exceptionally well in classic whiskey cocktails." The brand uses a proprietary process that extracts the liquid trapped inside the charred oak wood of a bourbon barrel it's been aged in— something not used by any other whiskey on the market. In addition to its unique positioning, Devil's Cut is supported by marketing, digital and retail support, including the "Make History" television spot that ran throughout 2014. "We look forward to continuing to grow Devil's Cut as the product gains momentum on- and off- premise," Jenkins says. "As the category leader in innovation, we certainly have a lot of exciting new offerings in the pipeline."